This page is about the aircraft P-51H-5-NA. For other uses, see P-51 (Family). 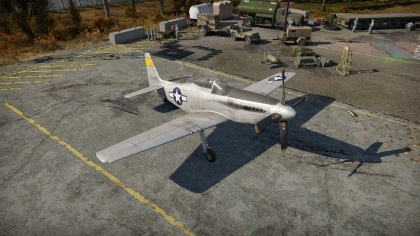 The P-51H-5-NA is a Rank IV American fighter with a battle rating of 6.3 (AB/RB/SB). It was introduced into the game in Update 1.71 "New E.R.A." The P-51H-5NA is the last propeller plane in the USAAF fighter line. While retaining all features the earlier versions may offer, its powerplant is upgraded. 38 mm Bulletproof glass in front of the pilot. 19.05 mm Steel plate in front of the engine. 6.35 mm Steel plate between the engine and pilot. 15.87 mm Steel plate behind the pilot. The P-51H-5NA is a high altitude turnfighter. It has impressive performance against most props it may face and it can put a considerable fight against earlier jets. Compared to its German and British counterparts, it outperforms them by a fair amount in engine performance. The P-51H-5NA can also be used as a strike fighter, as it can have great loadouts of combinations of bombs and rockets for this purpose. Whilst having great engine performance, The P-51H-5NA can turn impressively as well, outmaneuvering most of its German counterparts. It has good ordnance, capable of shooting any aircraft down with relative ease, as well as being able to dodge incoming attacks by jets. It has a good climbrate which also gives it an option to put up a fight against jet encounters, being able to perform boom and zoom attacks as its energy retention is good. It has a tendency to break its wings while zoom climbing at speeds higher than 550km/h. It also uses high octane fuel, which means it has considerable susceptibility to fire. At low altitude, fighting with a turnfighter mindset will mostly work. If jets are present, try not to drop your speeds too much, as you may need to dodge multiple shots. The P-51H-5NA will not perform as good against jets, as it does not have comparable speeds. BnZ attacks are the most effective against jets, as this manouever mostly removes the speed out of the equation. 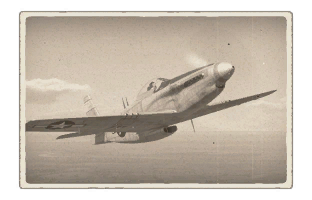 Most enemies faced by the P-51H-5NA will be easily taken down, but unfortunately it also faces jets from time to time. Me 262 and Ho 229 are the biggest predators of this plane. The Ho 229 will outturn you while the Me 262 will outrun you. This page was last edited on 6 April 2019, at 16:48.